So I have a question for you. Does pumpkin literally go with anything these days? I was trying to think about Pumpkin Combos That Should Never Be and every time I thought of one, I googled out of curiosity and sure enough, pages of recipes. Pumpkin and olives? There’s a recipe for that. Pumpkin vinegar? Recipe for that, too. Pumpkin and mustard? Go ahead, google it. It’s kind of weird. Like, who would ever think those combos would be delicious? Apparently I’m the one living in a box…and now I kind of want to try a recipe or five. Good thing it’s a complete no-brainer that pumpkin and cookies are meant to be. 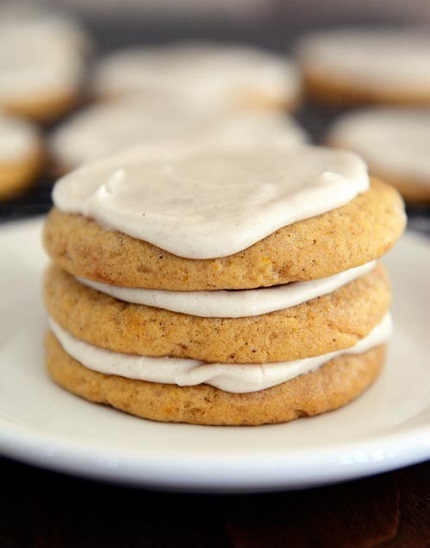 And to take it one step further, pumpkin and sugar cookies are a match made in paradise. I took a really, really old (but fabulous) recipe I posted way back in 2008 and decided it needed a pumpkin makeover. 1st batch = too bland, 2nd = too dry and puffy, 3rd = perfection. All of that work required a lot of pumpkin sugar cookie sampling. Of course, no one around here was complaining about that. Shocker. 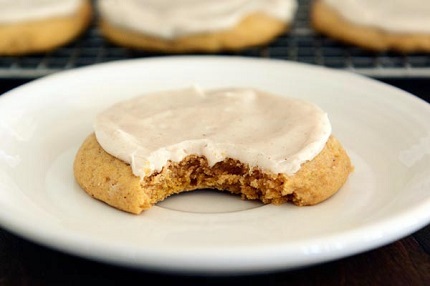 These pumpkin sugar cookies are perfectly soft with just the right amount of spiced pumpkin flavor, and the simple icing is creamy and sweet with a special hint of cinnamon. I swirled the icing on fairly thick (um, because it’s sweet and yummy), but you could mix it on the thinner side and have a glaze-like consistency. It’s really up to you. And I really think someone should try adding just a smidgeon of soft cream cheese to the icing. And then invite me over. Ok? Preheat the oven to 350 degrees F. Line two rimmed baking sheets with parchment paper or silpat liners. In a large bowl (or in the bowl of an electric stand mixer), cream together the powdered sugar, granulated sugar and butter with a handheld electric mixer until combined. Slowly drizzle in the coconut oil and mix. Add the egg yolk, vanilla and pumpkin and mix until combined. In a medium bowl, whisk together the flour, cream of tartar, salt, baking soda, cinnamon, nutmeg, ginger and cloves. Add the dry ingredients to the wet batter and mix well. Scoop 2 tablespoons of dough at a time and roll into balls (if the dough seems sticky, refrigerate for 20-30 minutes or lightly grease your hands — I was able to roll them right after mixing). Place the balls on the cookie sheet, about 2 inches apart. Using a drinking glass with a flat bottom, dip the glass in the 1/2 cup sugar (lightly grease the bottom of the cup the first time to help the sugar stick) and press each cookie to about 1/4-inch thick, dipping the glass in the sugar between each cookie. For the icing, whisk together the powdered sugar, cinnamon and nutmeg. Slowly add the milk (or cream) and whisk vigorously until smooth. Use more or less cream depending on the consistency you want (the thinner it is, the easier it will set so the cookies can be stacked). 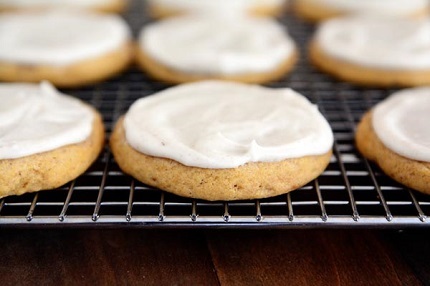 When the cookies are completely cooled, swirl a little icing on top of each cookie.